A remote, yet elegant fly fishing lodge in Western Alaska's Bristol Bay. Alaska’s Wood-Tikchik State Park is the largest and perhaps most unique state park in America. Bristol Bay and Western Alaska are blessed with the largest sockeye salmon runs in the world. Because of consistent and wise management practices, we fish in one of the world’s last sustainable Pacific salmon fisheries. The rivers this lodge operates are healthy and harbor large populations of all 5 species of Pacific Salmon, Rainbow Trout, Arctic Char, Dolly Varden, Grayling, and Pike. 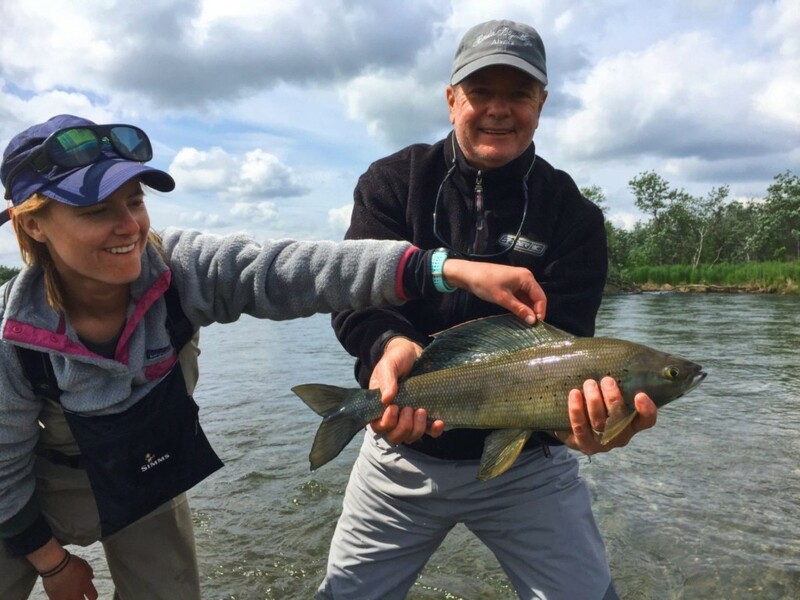 Strategically located between Wood-Tikchik State Park and the Togiak National Wildlife Refuge, our close proximity to both watersheds provides guests with extraordinary angling opportunities, rarely equaled anywhere in the world. For over forty-five years Bristol Bay Lodge has extensively explored and fished the Bristol Bay region of Western Alaska. What they have learned during this time has allowed them to design and fine tune a fishing program to maximize your experience during your week at BBL. During your stay you will fish a different location each day and have the opportunity to catch every species available to you during any given week. Each morning you will be informed of your next day’s adventure by your assigned guide and he/she will prepare you for the following day. Bristol Bay Lodge has six different and spectacular fishing destinations. Each fishery you visit will be unique and memorable. Four of these fisheries will be utilized in your two overnight camp experiences, and two will be fished from the lodge, as day fisheries. Weather permitting, you will fish a new and different location each day while at Bristol Bay Lodge, catch every species of fish available, and enjoy the total and ultimate Alaskan fishing experience! Two of Alaska’s most renowned fisheries, The Agulowak and Agulukpak Rivers are ‘home-waters’ for Bristol Bay Lodge. Both rivers provide some of the regions most productive and consistent fishing for rainbow trout, arctic char, grayling, and Dolly Varden. Additionally, these rivers are host to one of the largest sockeye salmon runs anywhere in the world. Each year several million sockeye salmon return to the Wood-Tikchik lake system most of them pass through these two rivers. The first sockeye salmon are usually caught around the 4th of July. During the peak of the run it’s not unusual to catch limits of these noble fish before lunch and spend the afternoon pursuing rainbow trout, arctic char, and grayling. Bristol Bay Lodge holds exclusive leases on two of the most exceptional fisheries in all of Western Alaska. During your week you will spend one night at each of these very different camps. These two remote camps offer Bristol Bay Lodge guests the chance to experience what Alaska is really about! The overnight camps seem to always be the highlight of the week for guests offering possibly the best wilderness experience in Alaska. Birch Creek Camp is located northwest of the lodge, about a 45 minute Beaver float plane ride from the lodge will get you there. This camp is strategically positioned on a braided and meandering tundra stream. Fishing will be done from the jet boats equipped with oars as well as walk and wade fishing in certain areas. In addition to all five species of Pacific salmon, you will find aggressive rainbow trout, record sized arctic grayling, and an outstanding population of large sea-run Dolly Varden sure to make your arms sore. Guests who return year after year and spent time at Rainbo camp describe it as “the edge of the world” a place where the wind in the grass brings whispers of ancient times. You can sit on the porch after an afternoon of fishing and look right out into the bering sea, the Walrus Islands cut into the horizon line and offer a spectacular view as the sky changes color. The camp is located on tidal water, at the edge of the Bering Sea. One huge benefactor of being so close to the ocean is each tide brings with it the promise of a fresh run of chrome hard fighting salmon…This camp also offers early season rainbow fishing, while numbers aren’t high the quality often is! A trip to one of the overnight camps begins like every other day at the lodge. After breakfast you will depart from the dock, at 8:00 AM, in one of our three de Havilland Beavers. You’ll enjoy a scenic 30-minute flight and land at one of our two spike camps on the Togiak River, where you will be met by guides who live on the water they fish, and know it intimately. Both of our camps on the Togiak River offer fishing for all five species of Pacific salmon, rainbow trout, and a prolific run of anadromous Dolly Varden. Our camp on the upper Togiak River is world-renown for its Dolly Varden and silver salmon, and at times, the fishing for rainbow trout can be extraordinary. The Togiak River camps are both a short boat ride from several smaller tributaries, and when the conditions are right, they offer excellent small-water fishing for rainbow trout, Dolly Varden, and silver salmon. After a memorable day of fishing on the Togiak, you will begin the final part of your journey to one of the overnight camps, arriving in the late afternoon. On the short walk to your camp, it’s easy to be overwhelmed by the stunning beauty and the placid serenity inherent to remote Alaska. When you arrive at the camp, you’ll be made comfortable, enjoy a light snack, and gear-up for your next fishing adventure. You’ll fish until evening, then a memorable dinner with your friends will be provided in the main tent. A comfortable night’s sleep and a hearty breakfast the next morning will prepare you for the next full day of fishing. You will return to the lodge the next evening at 5:30 PM. While these camps are remote, they are well appointed, comfortable, and safe. We make sure every aspect of your Alaska fishing trip is something you will remember forever. Both camps have three private, carpeted guest tents with two fixed beds, and fresh linens. On these beds you’ll find warm, full sized sleeping bags with fleece liners. The camps have running water, with a full service bathroom and shower if needed. In addition to the three guest tents, each camp also has a main cook tent that is used for serving breakfast and dinner. It also serves as a central meeting place for the beginning and ending of each day. This is where you’ll share fishing stories and laughter often late into the night. The camps are staffed with two experienced guides as well as a camp chef to take care of all of your needs. Both camps are equipped with state of the art satellite phones and marine radios should communication with the lodge be necessary. Bristol Bay Lodge has been ranked the fourth best fishing lodge in the world by Forbes magazine… and the best, number one, of all Alaskan lodges. Bristol Bay Lodge was newly renovated in 2018 and offers anglers a well-appointed facility that provides comfort and elegance with the joys of camaraderie in a wilderness setting that offers a breathtaking view. The main lodge features a professionally equipped kitchen, dining room, great room with fireplace, bar, library, and a large well furnished fly tying bench with everything needed to tie flies to trick the fish on the surrounding rivers and lakes. There is also a fully equipped fly and tackle shop where, should the need arise any angler can be completely outfitted. When the weather is warm the lodge decks are a favorite gathering places for appetizers, cocktails and our weekly barbecues. Relax in the hot tub or wood fired sauna after a long day of fishing, and keep your waders and rain jackets dry in our warming house. In addition to the eight spacious bedrooms in the main lodge there are four comfortable and private cabins set around the property. These cedar cabins are utilized for small groups or families, each offering a view of Lake Aleknagik. The chef will prepare a hearty breakfast and dinner each day. Breakfasts are made to order, and include your choice of hot and cold cereals, muffins, breads, fruits, eggs, French toast, pancakes, bacon, sausage, reindeer sausage, juices, and coffee or tea. Lunch on the water, unless you prefer otherwise will be a made over fire on the shore featuring fresh fish. Regardless you are provided a bag lunch. The fresh Alaskan air can heighten your appetite and midday snack is often appreciated. Dinners always begin with cocktails and appetizers. Throughout the week you will enjoy steaks, prime rib, crab legs, fresh salmon, halibut, shrimp, chicken, and pork. Dessert is made to compliment dinner. Please let us know if you have any dietary restrictions or preferences, and we will do our best to accomodate you. Days/Price: $10,250.00 per person can do single but need to pair with another single. Includes private charter. Short weeks: 3.5 day packages or 3.0 day packages when available. Charter flights from Dillingham to ANC can be scheduled and incl. in pricing. 7:45AM and 8:00AM departures from ANC. These flights will be arranged by Bristol Bay Lodge. Outfitter Pickup: From Dillingham, AK. Arrival in Anchorage – Full weeks run from Saturday to Saturday and you will want to arrive in Anchorage the night before your trip and stay in a hotel. We have a list of recommended hotels upon request. The morning of your trip you will depart from the lower level at gate L2 on a charter to Dillingham at either 7:45 or 8:00AM with the rest of the guests for the week. The charter is included in your package. Once you arrive in Dillingham – you will be met at the airport by Steve Laurent and his staff. The staff will help load your bags and you into the vans for a short drive to Lake Aleknagik. From here you will board one of the lodges covered boats for a short scenic boat ride to the lodge. This part of your trip is about one hour in total from Dillingham to the Lodge. Arriving at the lodge – You will be greeted on the dock by staff and escorted to the lodge where you will enjoy a filling lunch while our staff places your bags in you room or cabin. Afterwards you will receive an orientation with other guests for the week by Steve Laurent, BBLs general manager. You will then meet with your assigned guide, who prepares you for the rest of your day. You will either spend the afternoon fishing the legendary Agulowak river or depart for one of our exclusive overnight camps. If you fish locally, you will return to the lodge at 5:30, and be treated to cocktails, hors d’oeuvres, and a 4 course meal before learning about the following day. If you go to one of the camps, you’ll be met by your guides and camp host at the destination. The guides will carry your dry bag (provided by the lodge) of clothes and necessities to camp and give you the option to fish a couple hours before dinner. You will spend the night in one of the weatherport tents and fish the following day until about 3:30pm. You will return to the lodge the next evening, after a full day of fishing. The Daily Schedule – Bristol Bay Lodge makes sure you are prepared for your next day and each night assigns a guide to talk with you about the following days adventure. Whether day-fishing from the lodge, or spending the night at one of the exclusive overnight camps, you will be told what to expect, what to pack, and what rods, tackle and flies you will need for a successful day on the water. At 8:00 AM, after breakfast to order, you will depart from the lodge by boat, or in one of three de Havilland Beavers. After an enjoyable day on the water, complete with a delicious shore lunch, you will return to the lodge by 5:30 PM. Before dinner, which is usually served between 7 and 7:30 PM, you might enjoy a soak in the hot tub, or a steam in the wood fired sauna, followed by cocktails and hors d’oeuvres. Your Departure – On the morning of your departure, while you enjoy breakfast, your packed bags will be sent ahead of you to the airport. You will depart the lodge at 7:00AM for Dillingham, where you will be taken to the airport for your departing flight to Anchorage, and home. If you harvest your limit of Pacific Salmon, they will be brought to the airport, frozen in a sealed waxed box, and checked with your baggage. Each guest is able to bring home up to 50lbs of salmon. *The lodge gas a gift shop with quality jackets and rainwear. If you don’t have what you need just ask and the lodge will work to accommodate your request.